Use your idle computer time to help professional astronomers do scientific number crunching. You can click to see the past and current team members individual work credit totals. You can click to see the team statistical overview. 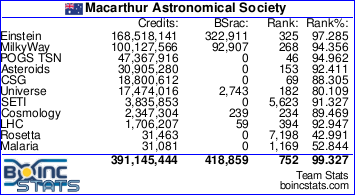 13th August 2012: Macarthur Astronomical Society team created in BOINC. 7th June 2017: Surpassed 100,000,000 credits. Download the free BOINC project management software and install it on your computer. You can click to obtain the software. Join one or more astromomy projects to run automatically in the background on your computer whilst it has free resources. You control the amount of your computer's idle resources to dedicate to projects, so it will not affect your computer usage. POGS The Pan-STARRS Optical Galaxy Survey aims to generate a multi-spectrum atlas in ultra-violet, optical & infrared wavelengths, of galaxies in the nearby Universe. Project Retired. Einstein Searches for gravitational waves from spinning isolated compact objects (such as pulsars) using data from the LIGO gravitational wave detector. Asteroids Aims to significantly enlarge our knowledge of physical properties of asteroids. SETI The search for extra-terrestrial intelligence in the Universe, using the radio spectrum. Milky Way Create a highly accurate three dimensional model of the Milky Way galaxy, using data gathered by the Sloan Digital Sky Survey. Cosmology Search for the model which best describes our Universe and to find the range of models that agree with available cosmological and particle physics data. LHC Simulates 60 particles at a time as they travel around the Large Hadron Collider ring for 100,000 loops (or more). testing whether the beam is going to remain on a stable orbit. Once you have installed the BOINC software, open it and go to the "Add Project" menu item. A list of projects will pop up for you to choose from. When you have a project running, don't forget to attach to our MAS Team by going to the individual project site link and look for "Your Account". From there you can enter the Macarthur Astronomical Society Team. Please contact Roger Powell for friendly help on getting started or changing the settings to suit you.